The Royal Monastery of the Incarnation (Real Monasterio de la Encarnación in Spanish) is a convent of the order of Recolet Augustines. The institution mainly interned women from noble families, and was founded by the Queen Margaret of Austria, wife of Philip III. The monastery was built adjacent to the then extant Real Alcázar (today, the Royal Palace), and had a passageway to allow the royals direct access. The monastery was inaugurated in the 2nd of July of 1616, a few years after the queen had died. The architect and friar Alberto de la Madre de Dios designed and built the monastery between 1611-1616. The facade has a sobriety recalling the style of Juan de Herrera. After a destructive fire, it was rebuilt by Ventura Rodriguez in 1767. Nestled in a little square between the Royal Palace and Plaza España, the Monastery is the second of Central Madrid's royal monasteries (the other is the Monasterio de las Descalzas Reales). The monastery, now partly a museum, has a wealth of works of art and relics including tubes with the blood of St. Januarius and of St. Pantaleon. The most important and interesting of these is the blood of Saint Pantaleon, which is kept in a glass orb. Every year on July 26, the eve of his feast day, the blood is said to miraculously liquefy. If it does not, then disaster is sure to follow (says the legend!). 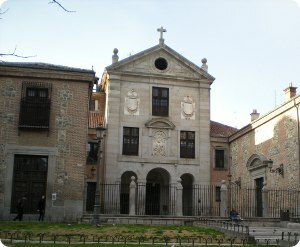 The convent includes a cloister and a fine Baroque church. 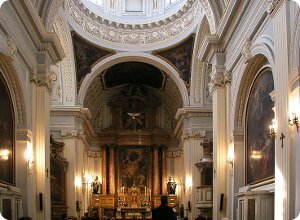 The interior of the church was redecorated in the 18th century, including frescoes in the ceiling of the main chapel by Francisco Bayeu, and a large collection of 17th-century art. The monastery is still active today, but the nuns stay out of sight during visiting hours. As at the Monasterio de las Descalzas Reales, visits to the Monasterio de la Encarnación are by guided tours in Spanish only.